The church’s season of Advent offers a sanctuary from the endless demands of preparation for the big day. Our Christmas traditions, if they are to be maintained, require a great deal in the way of preparation. But there’s one Christmas tradition that I’ve been enjoying since I was a child that requires little or no preparation save for the effort to carve out the time, when time seems to be in short supply. Somehow over the years, I’ve never missed the opportunity to watch the old black and white version of Dickens’ classic, A Christmas Carol. 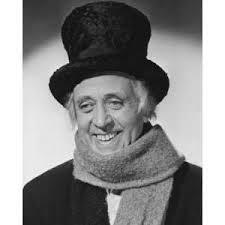 There is of course only one portrayal of Ebenezer Scrooge that will do. Keeping Christmas well is about being fully alive to all that life has to offer and being gracious in your responses to this amazing grace and living into all that God created you to be. When you keep Christmas well you are willing to believe that forgiveness is the doorway to a hope-filled future; that mercy reflects God’s nature; and that love is the most powerful thing in the universes—stronger than hate, stronger than evil, stronger than death! Keeping Christmas well is living with the knowledge that there is nothing in heaven or on earth that can separate you from the love of God in Christ Jesus. Scrooge’s metamorphous began, dancing and singing: “I don’t know anything, I never did know anything, all on a Christmas morning.” To keep Christmas well you must first realize that in the grand scheme of things you don’t know anything. For then, in humility, you can see the hope that lies in the manger. The hope of resurrection. This entry was posted in PONDERING PASTOR, Progressive Theology, SERMONS, STORIES, Theology and tagged Advent Devotion, Alistair Sim, Christmas resurrection, emergent theology, emerging church, evolutionary christianity, progressive christian sermon, progressive Christian sermon Advent 4B, progressive christianity, sermon Scrooge, spirituality, theology by Rev. Dawn Hutchings. Bookmark the permalink.